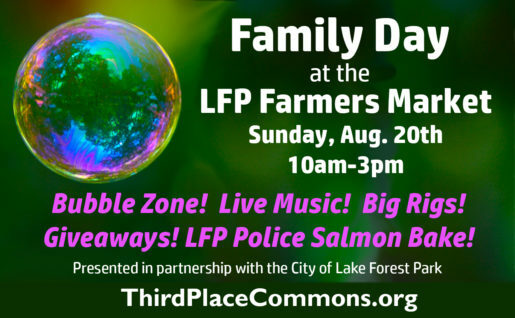 Don’t miss the fun at Family Day at the Lake Forest Park Farmers Market this Sunday, 10am to 3pm! Family Day is co-presented by the City of Lake Forest Park and is filled with special family-friendly additions for one day only. LFP Mayor Jeff Johnson will be there handing out goodies and sharing community information. And the city’s Public Works Department will bring in a couple of kid-friendly, “big rig” city vehicles for the little ones to explore. 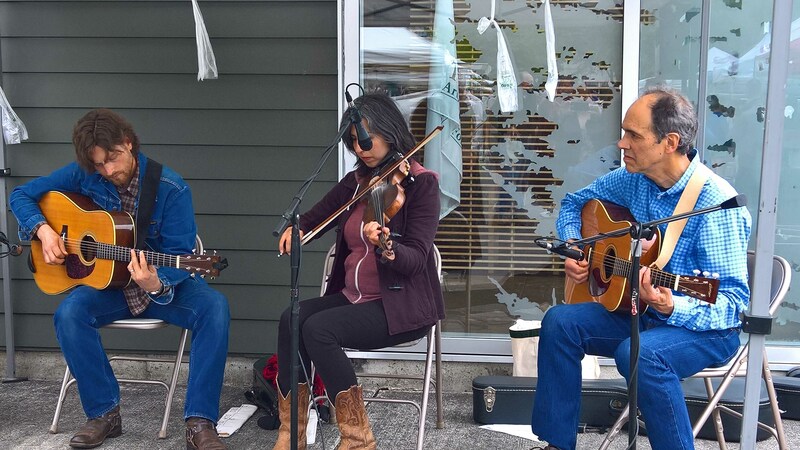 The day will also be filled with live music beginning with local favorites the Milner Family Fiddles at 11am, followed by steel pan musician Obe Quarless at 1pm. You’ll also want to be sure to stop by the Bubble Zone where youngsters can experiment with an assortment of bubble wands in different shapes and sizes. And the first hundred kiddos can take away free mini-bubble bottles of their own! In addition, the Lake Forest Park Police Department will join us for their annual Charity Salmon BBQ fundraiser with all proceeds to benefit the Special Olympics. They’ll be serving up baked salmon with sides, and also offering up a raffle with great prizes including New Year’s Eve Seahawks tickets. All this plus a dunking tank! Want to know who will be in the tank? You’ll have to stop by and see! The LFP Farmers Market is always a great place to spend your Sunday and this week will be extra special. So mark your calendars and be sure to join us. 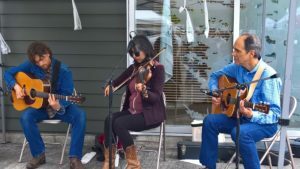 The LFP Farmers Market is presented by Third Place Commons and runs every Sunday through mid-October from 10am to 3pm at Lake Forest Park Town Center at the intersection of Bothell Way and Ballinger Way. See you at the market! * Third Place Commons is a community-supported 501(c)3 nonprofit organization dedicated to fostering real community in real space. All donations are 100% tax-deductible to the full extent of the law. Previous Post: Say YES to Access!